As some of you may know, I do feature reader questions on my blog from time to time, especially when they provide inspiration for science-y posts, like this post on parabens and safety, and this other post on talc and safety. Recently I received a reader question on the Elizavecca Bubble Clay Mask, and it's an ingredients analysis type of question - exactly the sort of questions I love to take a stab at! 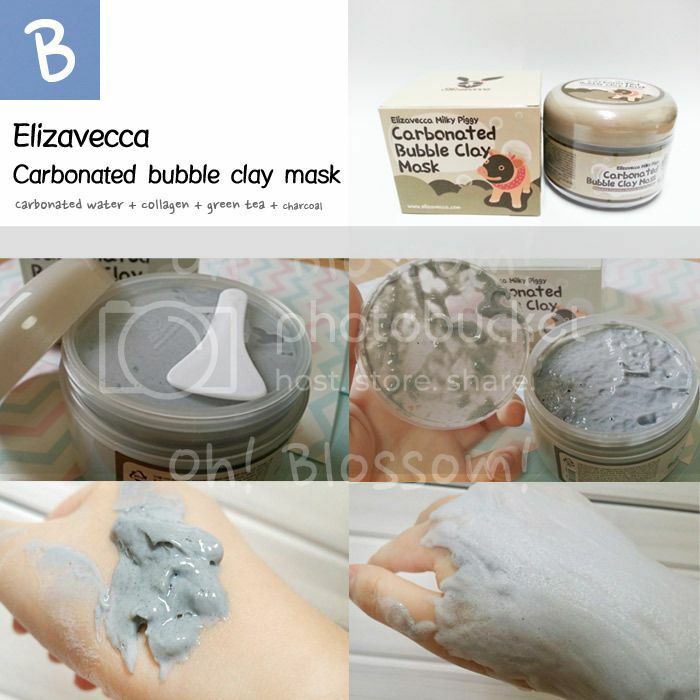 Do you think you could evaluate the "Elizavecca Bubble Clay Mask"? I bought it but I'm not sure if it actually works...it does make my skin feel smooth and soft right after but I'm not sure about any long term effects. I'm afraid this product might be mostly skintertainment because of the bubbles. I'm pretty sure a part of the reason why they're so popular is because the foam gives rise to all sorts of really cute, funny, or weird (sometimes all at once!) selfies, like this. I mean, imagine applying a mask and then having it foam and bubble up right on your face! That's pretty fun, isn't it? That said, bubble masks, despite the novelty value, aren't actually anything super groundbreaking, and masks of this format have existed for awhile. In fact, waaaay back in 2011, I reviewed just one such bubble mask from another Kbeauty brand, The Nature Lab Oxygen Shield Bubble Mask. And more recently in 2014, I reviewed a sort-of-similar product from a Western brand, the Elizabeth Arden Ceramide Boosting 5-Minute Facial, a 2-part skincare product where the first part also consists of a foaming mask. So while the Elizavecca one is more popular, it certainly isn't the first of its kind. Anyway, since this is a reader question, let's get back to the question, and then we'll talk a bit more about bubble masks in general. What's inside the Elizavecca Bubble Mask, and what makes it bubble? Does this bubbling really help skin? Do bubble masks in general really bring any skincare benefit beyond being novel or entertaining? Let's take a look, starting with the ingredients list! From the ingredients list, we can see that the main ingredients are water, surfactants (Cocamidopropyl Betaine, Sodium Lauryl Sulfate, TEA-Cocoyl Glutamate), some of which (Cocamidopropyl Betaine) also do double duty as foaming agents, and more foaming agents and foam boosters (Disodium Cocoamphodiacetate, Methyl Perfluorobutyl Ether, Lauramide DEA), and film formers (Acrylate Coppolymer). There's also clay (White Clay, Bentonite), humectants (Glycerine, Dipropylene Glycol), and a couple of skincare ingredients, some of which could be potentially useful to the skin (Green Tea Extracts), and some which are, honestly, pretty useless as far as topical application goes (Collagen - which I've written about in this post, and Charcoal Powder, which I've also written about previously in this other post). And then we hit the first preservatives (Phenoxyethanol), so we know that at this point, we've looked at the main ingredients in the product. After the preservative Phenoxyethanol, come the ingredients that are there in really tiny amounts. These include more preservatives (Methylparaben, Disodium EDTA), Flavouring Agents (I'm honestly confused by this, because who is going to eat the mask? I'm assuming this is a mistranslation of "Fragrance"), Carbonated Water, thickeners (Xantham Gum), and a couple more skincare ingredients (Allantoin, Butylene Glycol). There are also a variety of plant extracts (Lavender, Monarda Didyma Leaf, Peppermint Leaf, Freesia Leaf, Chamomile Filower, Rosemary Leaf), which are a mixed bag, as far as skincare benefit goes. Some are alright for skin, but others, particularly Lavender and Peppermint Leaf, can be potentially irritating for sensitive skins. But, they're not there in large percentages anyway, so I doubt they'll have much effect one way or the other. So, what really does this mask do? 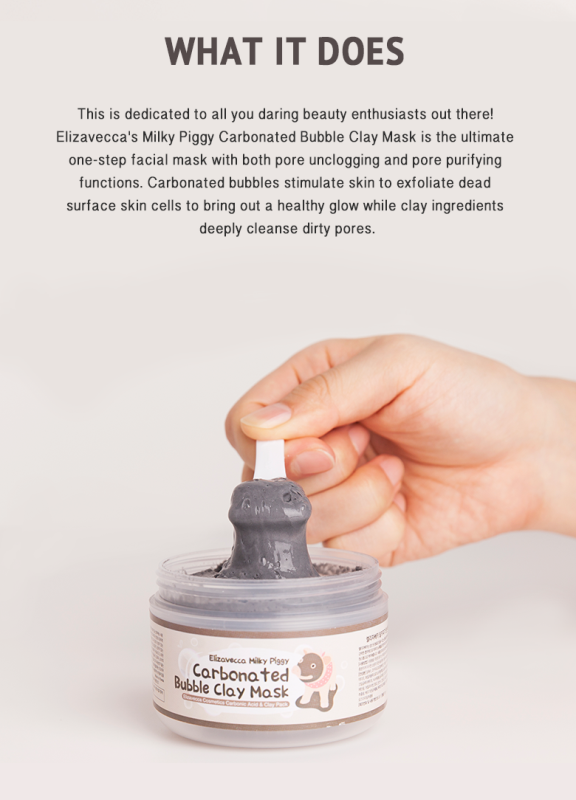 From this look at the ingredients, we can see that really, the mask is primarily just an ordinary clay mask with a base of White Clay and Bentonite (both of which are fairly common as far as clay masks go), surfactants and foam boosters, a couple of humectants, and Green Tea Extract. And I'm not counting the Collagen or Charcoal Powder because they don't actually have any real skincare benefit when applied topically, and the other skincare ingredients appear way after the preservatives, which means they are likely there in very small percentages - I'm talking small as in 0.something%. And in fact, if I really wanted to be more detailed, I'd additionally note that Green Tea Extract can often be a pretty volatile ingredient, so placing it in a formula with water, and in a jar packaging that's probably going to expose the ingredient to air and light, isn't a great idea. The combined exposure to water, light and air will probably greatly hamper the effectiveness of the Green Tea Extract, since one of its main skincare benefits is being an antioxidant. So really, at its core, the Elizavecca Bubble Clay Mask is just a clay mask with moisturizing properties. And a bunch of surfactants and foam boosters. A lot of them. So I guess the main properties of the Elizavecca Bubble Clay Mask probably aren't too different from any other clay mask - you have Bentonite and White Clay doing the most of the work, and a couple of humectants to ensure the clay mask has some moisturizing properties and doesn't feel dry on skin. But beyond that, the mask isn't going to have any particularly special benefits, and certainly the addition of surfactants and foam boosters isn't going to add to the skincare benefit of the mask. The surfactants might perhaps incidentally clean your skin when you rinse the mask off (the way a mild cleanser might), but they're not really aiding the benefit of the mask for the time it's being left on the skin. In fact, I'd go so far as to argue that they are there expressly for the purpose of making the mask bubble up and feel fun. There is, after all, an entire class of ingredients of foaming agents that exist just for this purpose (this site lists over 1000 such foaming agent mixes you could purchase). You don't often find them in masks, because they tend to be found in shampoos and body washes rather than in leave-on products. Which brings me to one last thing: So the Elizavecca Bubble Clay Mask has some surfactants. But does it matter if your leave-on clay mask has surfactants and foam boosters in it or not? Probably not. If your skin is fairly normal and not sensitive to any of the surfactants or foam boosters, it's not an issue. Most people will probably use the bubble mask and feel that it works just fine - in fact they might like the mild cleansing effect the surfactants offer when the product is rinsed off at the end of the masking experience. But it just seems so unnecessary to me to have them in there, since they don't contribute anything to the product. For me personally, if I'm going to apply a clay mask, I'd rather it not have random surfactants and foam boosters inside, especially since it's a leave-on product. I'd rather just play it safe and remove the unnecessary ingredients, and not risk any irritation from them. But then again, that would take out all the fun of using a bubble mask in the first place. So I guess it's really a trade-off that the consumer has to make, based on their own product preferences and skin type. So, going back to Elizabeth's question, does the bubble mask really work? The short answer is that it does, but not really beyond what a normal clay mask would do. It could help to absorb some oil from the skin like a normal clay mask would, but unlike the ad claims, it's not going to dramatically remove blackheads or "purify" or "stimulate" skin. What are the long-term effects of using the mask? Again, probably similar to that of a clay mask. Is it worth getting? I suppose if you are looking for a clay mask and like the novelty aspect, then it's worth trying. While I wouldn't bill this as an "OMG MUST GET SO LIFECHANGING" product, I don't think there's any harm from using it either, unless you are sensitive to any of the surfactants in it. At the end of the day, if having a bubbles makes applying a mask more fun, then that may be benefit enough for some people to make the mask worth buying. I have a friend who uses (and likes) it and reported "it tingles a bit". Perhaps that's what the ad meant by "stimulating". Seeing the ingredients, I'm betting on the peppermint to do that, or possibly some other mild irritation from one of the surfactants. Personally, I find all bubble-type products gimmicky and fairly pointless, but I also find it a teeny bit annoying how brands will add a bunch of stuff to a clay mask just to mark up the price. Actual plain clay is SO cheap it really should be more easily available everywhere, sigh. I've used two carbonated clay masks before- Elizavecca's and Bioaqua's (which I bought by accident.) Both work the same and gave me the same results. I agree; they're not magic products, though they do more good for my skin than nothing at all. The main appeal of them for me, and the reason I keep buying more, is because I'm impatient and clay masks always take an hour and half or longer to dry on my face. These only take about 15 minutes to bubble up for me and then I can rinse it off. The main reason I'd recommend this to anyone is because of the convenience. I do wonder if leaving a regular clay mask to dry on the face gives better results as opposed to the quick nature of the bubble version, but I've not tested this out myself.